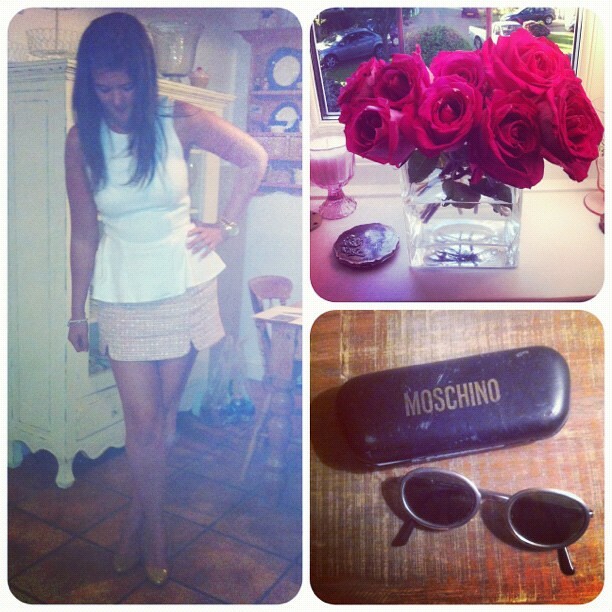 Peplums and bouclé skirts, wintery sunshine and pink roses, and pair of vintage Moschino sunnies… just a few of my favourite things at the moment. My Mam and Dad went to Tynemouth this weekend and among the goodies they brought back, they got me these gorgeous vintage Moschino sunglasses. It’s the wrong time of year for them, but they were a steal at £8 so when the rents spotted them for me, they were sure to snap them up quick! My Dad mentioned putting them away for my birthday but since that’s in November, then it’d look pretty odd getting a pair of sunnies off them. I’m a little confused right now as to whether I want it to be winter or summer. This morning was bright but it was that winter sun that never seems to get you warm. All I can think is that as soon as the weather gets cold, I can start looking forward to my favourite time of the year.. I adore the sunnies and great peplum top.